As the title says it's a new season and a new beginning. I have struggled with my weight for a long time, but to look at me you would not guess the number on the scale, but after the birth of my boys I have developed the mummy tummy (I had it after my daughter) and a little bit of the dreaded "twin skin". 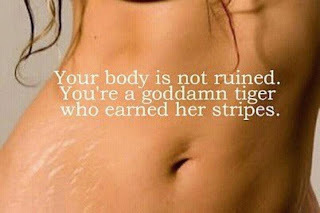 That is where your belly has stretched so much that the skin kinda sags. My tummy looks like a deflated balloon and not to mention the stretch marks. I never knew that they could run horizontally and vertically. I am in no way ashamed of my stretch marks (I view them as my tiger stripes). What I don't like and I am going to work on is the number on the scale and getting my stomach back to a relatively normal shape. That is where this blog comes in...I think that if I have a place where I can vent my frustrations and successes by writing it down I will be a little more accountable for my actions and will have success this time around. I am hoping to at least write once a week, but if I don't well...with 3 kids on the move you can understand. With only 4 hours of sleep last night I have managed to eat what I had planned for the day and I have done my fist day of Mom's into Fitness exercise program. 30 minutes of kickboxing, and weight resistance and core. I am tired but feel better that I have done it. Now the challenge is to stick with it! My usual pattern is do the first 2-3 days and then feel too sore and tired and don't do anymore. This is a 60 day program and I am committed to making this work! My daughter is loving being a big sister and is learning to play with her brothers instead of just playing. It helps that her brothers are at the age that they are curious about everything and she loves showing them how things work. The boys are crawling and doing stairs so we have baby gates everywhere so that I can make sure that no one will fall without me looking as their favourite pastime is to go in different directions. They are in full teething mode and my first born son now has 4 teeth and is working on number 5 and the second born son is working on teeth number 3 and 4. It makes for short naps and sleepless nights. They are my pride and joy so for this short time I will endure the unhappiness of the boys and try to ease the teething pain with popsicles and cold wash clothes. Thank you in advance for reading the rants of a stay at home mum. I love being at home with my kids and would not change anything for the world. So glad to see you're blogging, too! Definitely looking forward to reading more about your daily life with the trio. PS - You look terrific as is, and I'd kill for your figure! !